Today is my favorite day, the one day I get to do nothing. Of course I won’t sit on the couch all day, even tho I could. I just love Sundays. The whole day is so relaxed and there is no pressure to do anything. I usually reserve this day to do baking and today is no exception. I plan on baking pumpkin bread, chocolate chip cookies and if I have time maybe another type of cookie to be decided later. I need to find a good pumpkin bread recipe, if you have one you want to share let me know. I have looked on the internet and I can’t choose, they all look so good. I already have a great chocolate chip cookie recipe so I know those will turn out great. I shared the recipe in another post a few weeks ago. If you want to check it out here is the link. Well I better go get started. I hope you all have a great Sunday. Hello Sunday, how I love you. Even though my son woke up at 4am which would have been 5am but with the clocks going back an hour, he got confused. Oh well such is life. As all of you know I love Sundays and I never do anything on Sunday, except the necessary things. Today will be no different. I plan on making a pancake breakfast and we are going to eat it in the living room in front of TV, yes we are going to break the rules just this once.shhh don’t tell anybody. I might even break the rules even further and bake chocolate chip cookies. I love baking and do so has often as possible. Not to brag but I make the best chocolate chip cookies. While I follow the recipe on the back of the chocolate chip bag I do change a few things. You know the recipe I am talking about. 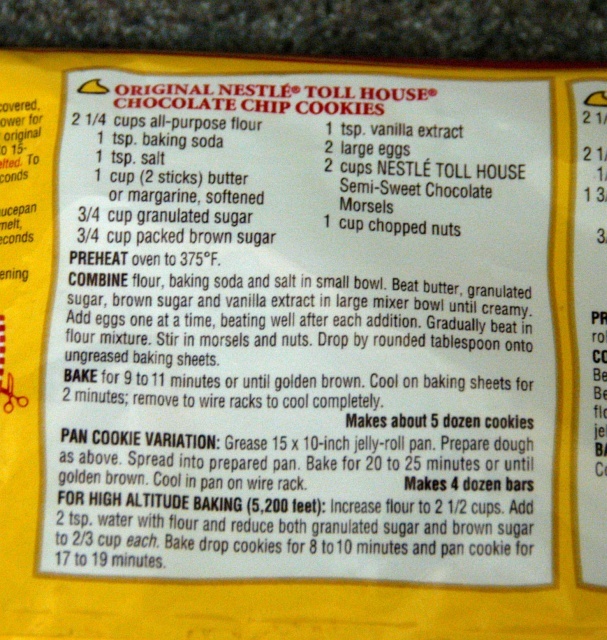 I found a picture of the recipe online. Thank you Google. As you can see the recipe tells you to mix the ingredients in different bowls. I disregard that and I just mix all the ingredients in one big bowl. The recipe calls for the butter to be softened, I melt my butter. Yes you heard me I melt the butter. I use the same amount that the recipe calls for. I just melt the butter in the microwave. I melt my butte first after I preheat the oven. While the butter is melting I put all the other ingredients in the bowl except the chocolate chips. I don’t stir. When the butter is done I add the butter to the other ingredients and then I stir. When I get all the ingredients stirred. I have to add more flour. Now here is the tricky part because there is no magic amount of extra flour to add. You just can’t add to much or you will ruin the dough. USUALLY its about a cup more, BUT not always. After I mix in the extra flour I then add the chocolate chips and nuts if I desire. I hardly ever add the nuts. I then take a spoon and just drop the dough onto a cookie sheet and bake as directed. The cookies don’t come out flat like they would if I had followed the recipe as they have it written they come out more raised and thicker. Here is a picture of the finished cookies. 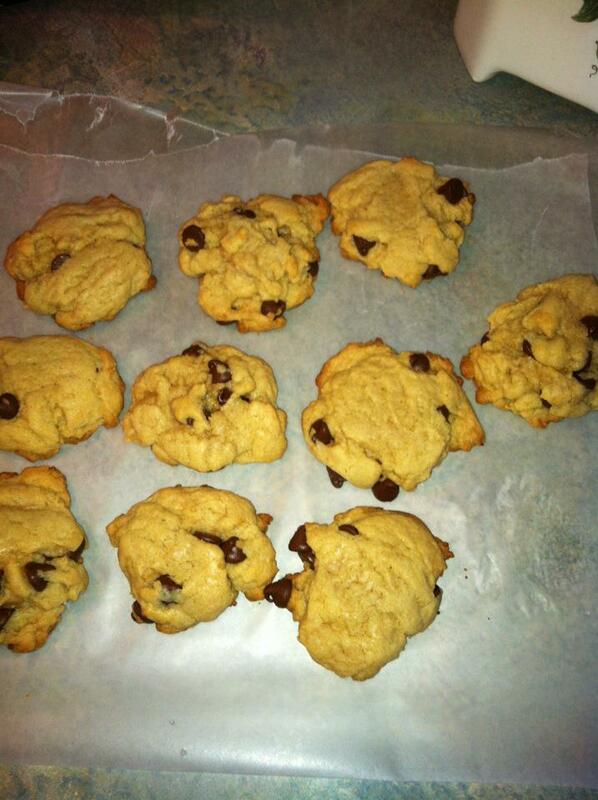 Keep in mind they can be a little drier then normal chocolate chip cookies if you go crazy with extra flour. Well I am off to go make pancakes I hope all have a great day. Happy Sunday!